Next year promises to be a very good year for LEGO train fans with the release of the ‘EXPERT’ set “10233 Horizon Express”. This is a very good looking high speed train kit, most certainly based heavily on certain verions of the French TGV. What is especially cool is that the set is designed so that buying two (the kids will love it!) means you end up with a full two-ended set. I’m very impressed by all the though that’s gone into this one. UPDATE: 10233 Horizon Express is now available! Build the ultimate high-speed LEGO® passenger train! Fly down the track in the Horizon Express! 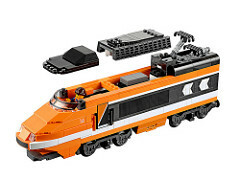 Collect this highly detailed LEGO® interpretation of a modern, high-speed electric passenger train! The detailed body features black train windows, brick-built chevron detailing, extendable pantographs, printed windscreen and brick-built doors. Remove the roof to play inside 2 detailed passenger cars! Steer from the front engine car with, a control panel and brick-built electrical box! Then take to the tracks in luxury with the first-class car’s seats, luggage, newspapers, computer screen and even a bathroom with sliding door! The rear car features a bar with hinged counter, tables for the passengers with seats, a coffee machine, cups and bottles. For the ultimate high-speed experience, attach a second Horizon Express model, or motorize it by adding LEGO Power Functions! Hard-to-find elements include orange LEGO bricks (including 6×28 chassis plate) and printed tiles. Ride the rails in high-speed LEGO® style! Oh my, look at all that orange! Looks cool. I’d love to see them do a Virgin Pendolino next. Oh man, I can see the Mission Impossible setup now! Love the Mission Impossible idea! Wow, that is definitely a great looking set. And I’m not even really into LEGO trains. Why don’t they just call it a TGV?